On the strength of his new jack swing/R&B flavored hits, Big Tyme earned Heavy his first platinum plaque. Things were looking bright for the crew, and then tragedy would strike. While touring during the summer of 1990, promoting the Big Tyme album, one of Hev’s back-up dancer Trouble T. Roy died from injuries that occurred after he fell from a parking ramp. T. Roy’s passing eventually led to Hev dedicating the follow-up album to his deceased friend, which he would title Peaceful Journey . Hev would recruit some of the biggest and best producers in hip-hop for Peaceful Journey. While it didn’t move as many units as Big Tyme it did earn Hev his second consecutive platinum plaque and received pretty decent reviews. I last wrote about Heavy D back in 2011, nearly 8 months before his untimely death. Dwight “Heavy D” Myers died of a pulmonary embolism that, according to the coroner’s office, probably occurred during an extended airplane ride. Heavy D was only 44 years old. Last week (November 9) marked the 3rd anniversary of Hev’s passing, and as I prepare to listen, review, and reminisce over Peaceful Journey , I still can’t believe he’s gone. Now That We Found Love – This remake of the O’Jays classic was the second single released from Peaceful Journey. This Teddy Riley produced version is a R&B/techno track designed to get the listener on the dance floor. Just in case the instrumental wasn’t enough to give it that crossover appeal, Riley’s invites his old Guy running buddy, Aaron Hall to sprinkle his soulful vocals on the hook. Hev does what he does best on this one: chop it up about girls and love. While he is far from being a top-notch lyricist he holds his own with his nimble flow. If you hate this song I understand, but I’ve always kind of liked it, even with it being a blatant attempt to reach the pop charts. Let It Rain – Hev’s little cousin and future legendary hip-hop producer, Pete Rock provides a smooth instrumental over some of his signature rough drums. Of course Hev uses this song to woo the ladies. I forgot about this song. This is pretty decent. I Can Make You Go Oooh – Sticking with his theme, Hev maintains his focus on the ladies. Howie Tee (yes, Chubb Rock’s Howie Tee) provides a smooth instrumental that Hev smoothly rides like only Hev could do. Nice. Sister Sister – Hev takes time to shoutout all the strong black women who sacrifice, strive, and succeed despite the odds being stacked against them. The Marley Marl produced instrumental has Marley’s signature R&B tinged feel but stays true to its hip-hop roots. Even if you can’t feel the instrumental you’ll definitely feel Hev’s heartfelt rhymes. Don’t Curse – Our host invites Kool G Rap, Grand Puba, Big Daddy Kane, C.L. Smooth & Pete Rock (who also produced the track), and Q-Tip to this cypher joint with censorship as the theme. With a list of such legendary emcees you would expect this one to be epic. It’s not. PR’s instrumental is decent and all the emcees (with the exception of Pete Rock) stay on task and provide serviceable verses; but the song is missing that magic to make it special. 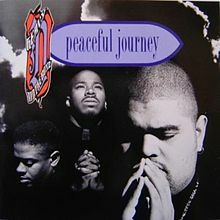 Peaceful Journey – If this isn’t my favorite Heavy D song it’s definitely top three. Eddie F chops up the bass line from The Jackson 5’s “This Place Hotel” and lays it underneath a soft synth melody which gives the instrumental a rough edge while still maintaining a somber feel. Heavy focuses on societal ills and the everyday struggle of the average Joe, easily making this one of his deepest songs, lyrically. This title track is ultimately a dedication to Trouble T. Troy, but it takes on an even deeper emotional connection now that Hev is gone. The Lover’s Got What U Need – Marley Marl gets his second production credit of the night as he borrows from Diana Ross’ “Love Hangover” and turns it into a sick instrumental for Heavy to get his “brag on”. Cuz He’z Alwayz Around – I never cared much for this Pete Rock produced joint. Now that I think about it, most of PR’s instrumental on Peaceful Journey are pretty underwhelming. Imagine that. Is It Good To You – This was the lead single off of Peaceful Journey . You may also remember the same instrumental and hook being used by vocalist Tammy Lucas on the Juice Soundtrack, with both songs production credit going to Teddy Riley. This is vintage Heavy D: smooth R&B tinged instrumentals with Hev rapping smoothly to win the ladies affection, hence the overweight lover moniker. Letter To The Future – Yet another underwhelming Pete Rock produced track. Hev uses this one to address the perils of the inner city youth. He does make an interesting assessment about blacks being more unified in slavery than in freedom (“maybe if we were still slaves we’d be closer however, picking cotton was bad but we picked it together”). Even with that thought-provoking line, I’ve never cared much for this one, and not much has changed today. Swinging With The Hevster – Over a stripped down up-tempo Marley Marl instrumental Hev gives his best effort at battle rhymes. Hev won’t make you hit the rewind button, but he turns in a serviceable performance, making this a decent listen. Body And Mind – Our host gets in touch with his Jamaican roots as he does a little chanting on this R&B tinged reggae instrumental. Somebody For Me (Jazz Love Mix) – Eddie F gives this Heavy D/Al B. Sure collabo from the Big Tyme album a jazzy remix. Me likey. Peaceful Journey follows the same blueprint that worked for Heavy D on his two previous albums: his own brand of R&B flavored hip-hop that allowed him to appeal to the masses and still maintain street cred (well, at least a wee bit of street cred). If you’re looking for boom-bap beats and thought-provoking lyricism, you’re listening to the wrong album and artist. Peaceful Journey (and most of Hev’s catalog for that matter) might be too soft for a lot of hip-hop heads, which I can understand, but I can appreciate a chunk of the album. Heavy wasn’t the greatest or most talented emcee, but he was definitely an underappreciated one. His death brings truth to the saying: you never know what you have until its gone. RIP Hev.